Takata-Petri supplies all seven of the airbags in the new Mercedes-Benz C-class coupe as well as the car’s front seat belts. 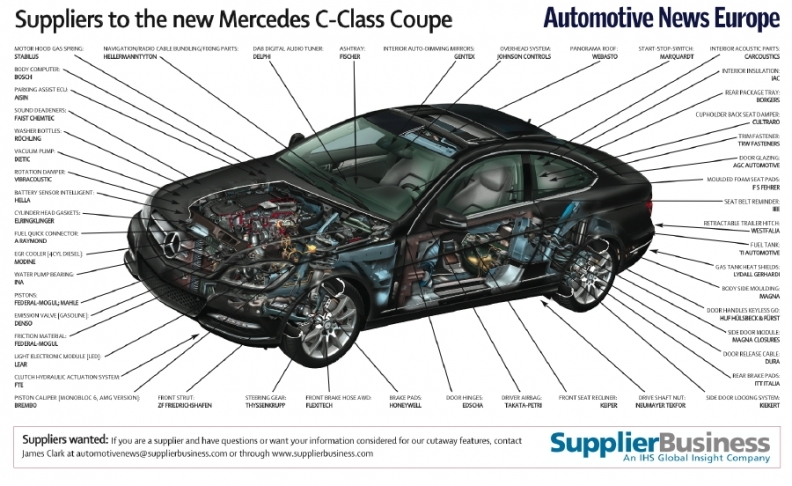 Those parts play an important role in the C-class coupe’s top safety rating of five stars from testing agency EuroNCAP. Available as an option in the new coupe is a 12-speaker sound system supplied by Harman. Using Logic 7 multi-channel spatial sound technology, the surround sound system produces 450-watts of power. In addition, it uses speed-sensitive volume adjustment technology that adjusts the sound output according to ambient noise levels. Robert Bosch supplies the starter for the C-class coupe’s fuel-saving stop-start system. Bosch also sources the car’s parking assist system, body computer, spark plugs, auxiliary water pump, fuel pump, engine cooling fan and the direct injection system for the gasoline engines. Launched at the 2011 Geneva auto show to round of the new Mercedes-Benz C-class range, the new coupe has been in production since last March. It is built at parent Daimler’s factory in Bremen, Germany. IHS Automotive forecasts the coupe’s production to peak in 2012 at 36,842 units while output is expected to fall slightly in 2013 to 34,932.